 Full service café - click on Cafe page for a menu! Note: It is recommended to call for lane availability during our league season - September through April. You don't have to be a good bowler to have fun! Come try once and see what you think. Our staff is more than willing to teach you the basics and help you get better at your game. for a reservation for complementary coaching! All Leagues require a 30-week commitment. "Split Leagues" are available with management approval. Corporate sponsored leagues are encouraged! *All League bowlers receive a discount on open bowling games. Let's start with the scoring of bowlingmany people have a hard time with this!!! A bowling game consists of ten frames. In each frame, a bowler has two attempts to knock down ten pins. If a bowler knocks down all ten pins on his first try, then he/she receives a strike. If a bowler leaves pins after his/her first try, then he/she gets one more try to knock down the remaining pins with a second shot. If all of the pins are then knocked down, the bowler receives a spare. Strikes and spares each have an advantage. If a bowler bowls a strike, then his next two throws are added to the strike. If a bowler gets a spare, then the next throw adds on to that spare. A spare and a strike are worth ten pins each. Example: Sally throws a strikethat is worth ten pins. Sally throws her next ball and gets an eight. She gets one more try and gets a spare. The two balls make a total of ten, added on to the ten for the strike, make twenty pins total for the strike. 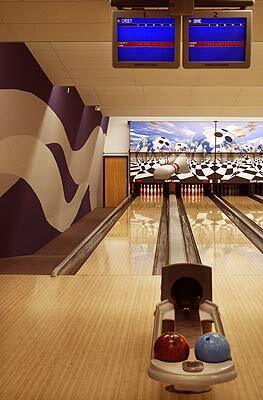 Example: Sally throws a sparethat is worth ten pins. Sally throws her next ball and gets an eight. That throw of eight pins adds on to the spare in the previous frame to make eighteen for the spare. There is a catch. In the tenth frame, if a strike is bowled, the bowler gets two bonus balls to add on to that strike. Likewise, if he throws a spare in the tenth frame, he gets one more shot to add on to that spare. These bonus throws score nothing by themselves, they only add onto the previous throw. So, if a bowler gets ten strikes, he still has two more shots. Those last two shots add on to the tenth strike to make that strike thirty. The previous strikes were all worth thirty, thus making the game a total of 300, a perfect game in bowling. Fouls occur when a bowler steps on to the lane while throwing his ballthere is a line indicating the end of the approach. Also, in order to be scored a foul on that ball, the ball must be released. So, if Sally flies down the lane with her ball still in hand, she wouldn't receive a foul because she never released! However, if Sally didn't go across the line, but one of her acrylic fingernails did, she would score a foul. 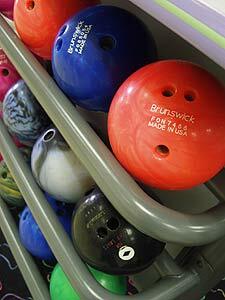 A bowler may not throw a gutter ball on purpose, or he receives two gutter balls for that frame. Bowling Etiquette involves sportsmanship, consideration of others & common sense. Observe a one-lane courtesy by NOT stepping onto the approach until the lane beside you is clear. Take your time, but remember there are other bowlers waiting to roll the ball in the lane next to you. Do not step past the foul line; ask for assistance. Don't use another bowler's equipment without permission. Bragging, heckling or griping has no place on the lanes. Please refrain from using abusive language or obscene gestures. Don't carry refreshments onto the approach area. Foreign matter on a bowler's shoe may cause them to slip and fall. Please - Please inform the desk immediately if a spill happens, we will be glad to clean it up. We suggest removing shoes when leaving the tile area. Play to win but be gracious in defeat. Be a good sport regardless of the score. If your ball doesn't return - STOP BOWLING and inform the desk. Please remove your bowling shoes before going outside or wear protective covers. Dirt tracked onto the tile and/or approach may cause a bowler to slip or fall.